When I engaged in creating hundreds of Hydrangea blossoms to adorn the wedding cake with I didn’t really stop to think too hard about how I was going to get them on the cake… It can’t be that hard right? I purchased a pot of edible glue (amongst many other things from the lovely cake shop) and trotted off to carry on baking, pushing all thoughts to the back of mind about how edible glue works. 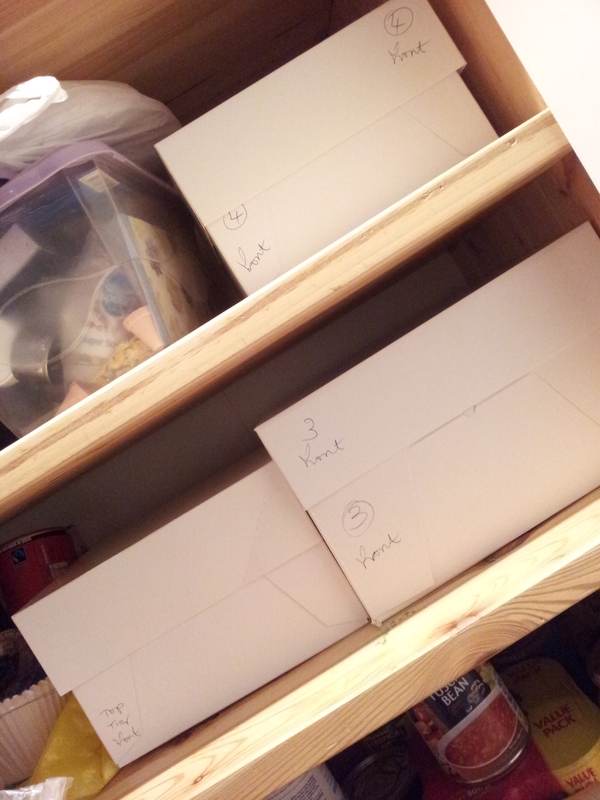 Fast forward 3 months to December 2012 and I have now 5 iced wedding cakes resting nicely in their cardboard cake boxes, up on some book shelves in our spare room/wedding dumping ground. I have 1 extra iced cake just in case of any disasters and 2 naked fruit cakes leftover from the epic baking stage of this cake. We were going to celebrate Christmas early this year, what with the wedding being on 30th December. So I started wrapping all of my presents very early. I was wrapping until 11 one night and popped everything under the tree only to look up and discover yellow stuff running down the walls, behind the tree. I showed Chris and he discovered that I had also placed all of my freshly wrapped presents into a quickly mounting pool of water gathering under the tree. The wall was quickly turning into a water feature in our house. It also joins onto the spare room. A spot of investigating further revealed that the flood had started in the spare room, saturated the wall and then seeped into the living room and across the floor! Thank god my dress was at my parents house and thank god for Kate’s cake boxes! They were the perfect protection against any damp that was lingering in the air (there was a lot!). Luckily the shelves weren’t up against the soaked wall too and lucky that I had been wrapping presents to discover the leak as I wouldn’t have noticed it until we were swimming in our sitting room. One emergency cake evacuation later and removal of everything out of my kitchen cupboards, the 8 cakes had a new dry home! 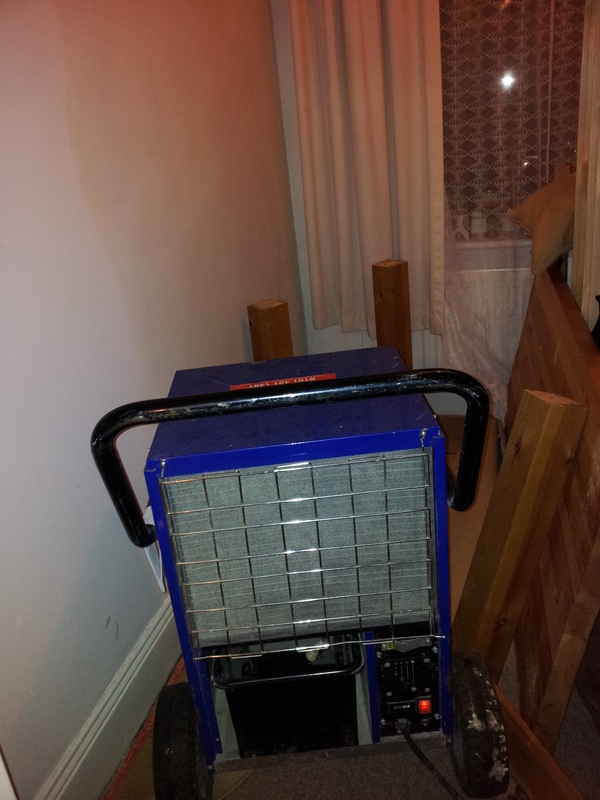 Our landlord delivered a dehumidifier to get rid of the damp and the stink and we were good to go. Although further calamities were awaiting me whilst Chris was away for his stag do and I had friends round for festive fizz, mulled cider and spare wedding cake tasters. The dehumidifier started to leak! I then flooded the toilet trying to mop it up and broke a handle off the door just before everyone arrived. I think it was best to get all the bad luck out of the way before the wedding. To give myself plenty of time to glue the flowers on to the cakes I set aside a Saturday the week before Christmas to give them a chance to dry fully and me to repair any breakages/falling offs. This happened to coincide with the painter coming to repair our flooded flat. It made for an interesting 5 hours of glueing flowers whilst directing decorators to dust pans, brushes and keeping the cat at bay. Edible glue takes a ridiculously long time to dry! In hindsight I think royal icing would have been a MUCH better idea… I used a cocktail stick to smear a little spot of glue onto the back of each flower (which had become really rigid and quite fragile so had to be handled extremely carefully). 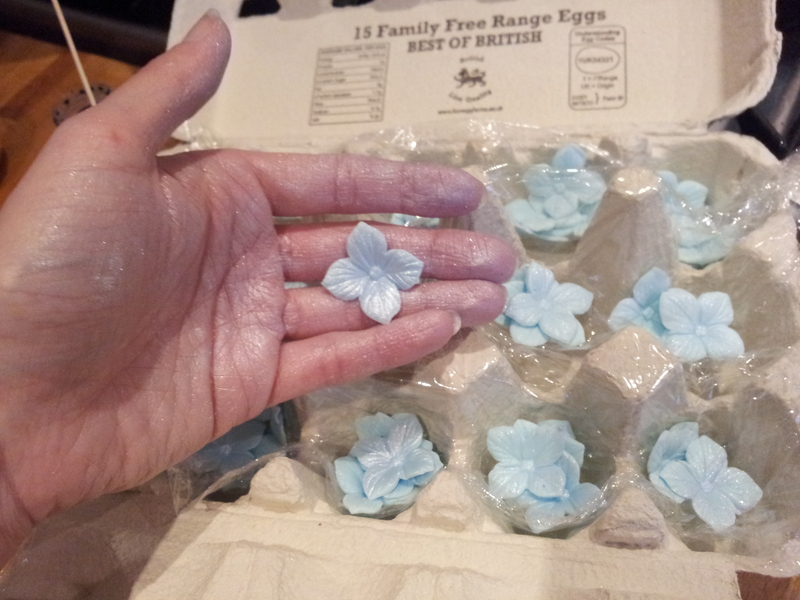 The moulded reverse of each flower results in grooves and ridges that the glue disappears into. It needs a bit more glue so that the it can actually touch the cake. The glue should be tacky before attempting to apply it to the cake… If you try to stick it on while the glue is still runny you will have a happy game of chase the flowers as they fall off the cake leaving a trail of glue which has now taken on some of the blue food colouring all down the cake. Many of the flowers fell on the floor and smashed this way but I also realised that I have quick reflexes, almost a cake decorating ninja. The painters were highly amused by my antics in the kitchen where I didn’t even stop for a cup of tea for 5 hours whilst contorting myself into all shapes to catch the falling flowers and hold 4 flowers in place with each hand until the glue dried enough to support their weight. Patience and flexibility were useful qualities to have a this stage in the cake decorating process. It’s a good job I do yoga. 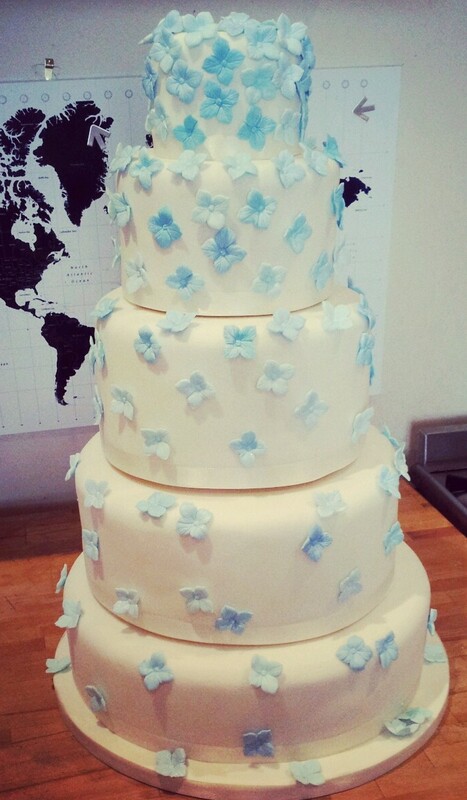 Zoe Clark’s original design for this cake uses buttercream icing to cover all of the cakes. The sugar flowers can then simply just sit on the buttercream and be held in place. No glue required. The fondant icing that I used, had now hardened and had no give to it to help hold on to the flowers, so it really was the glue doing all of the hard work. I realised after about an hour of catching and reapplying flowers that I needed to paint the flowers with glue, leave them for about 5 minutes and then the glue would be just about right to stick it onto the cake. Some flowers also had to be rejected as when they dried they hardened into such a curly shape that they lacked a flat area on the back where I could paint the glue on. 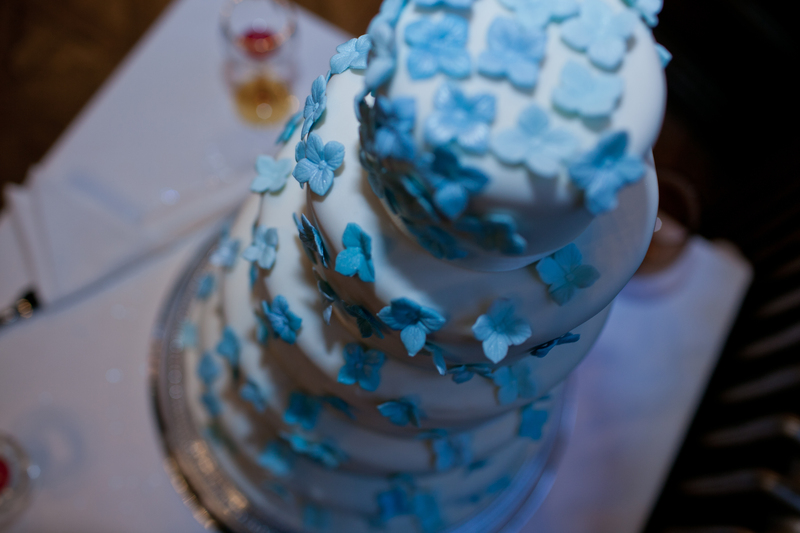 I wanted the flowers to appear as natural as possible cascading down the cake. 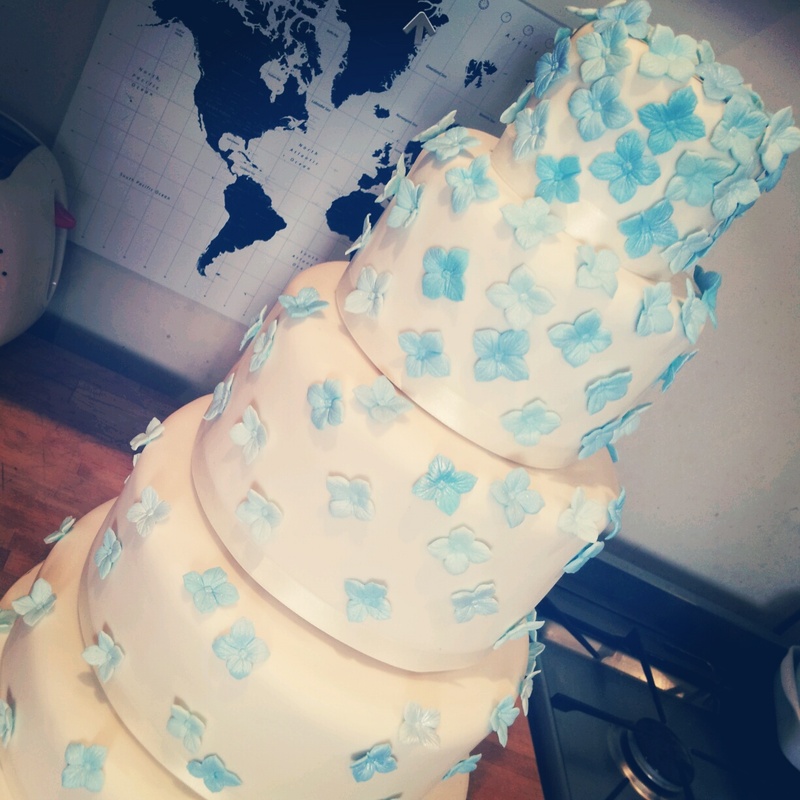 I chose a combination of hues of the blue hydrangea blooms and applied them randomly at different angles to the cake to give a more varied finish. Tapering off towards the bottom of the cake. With most of the flowers stuck into place, reserving a gap down the back of the cake, so I had some space to pick each cake up and stack it back together later on. I retired for an essential lie down. A couple of hours later the glue was really dry and the flowers were stable enough so the cakes could be returned to their boxes and shelf for safe keeping. Back in it’s box. 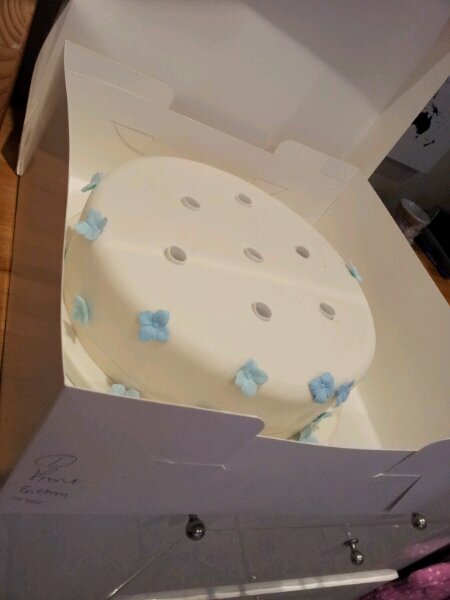 One Boxed Tier – note the gap down the back – no flowers here yet so it can be handled without damaging the decoration. 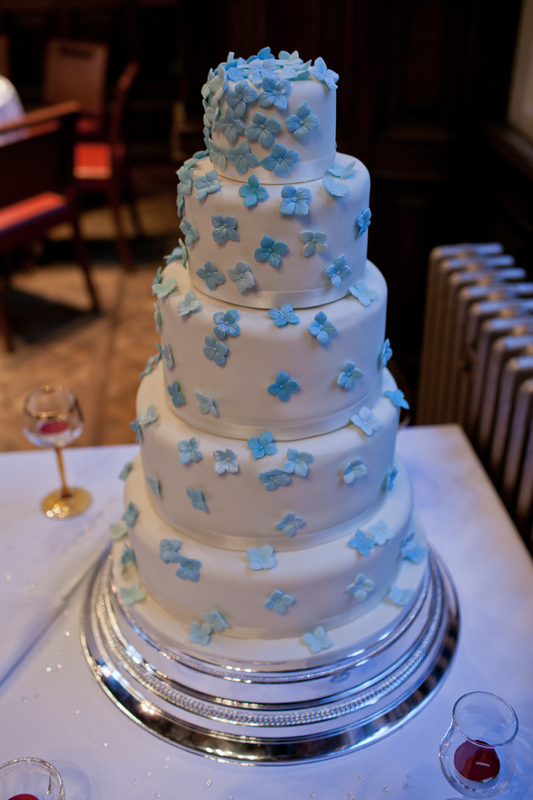 I arranged to deposit and arrange the cake at Jesmond Dene House the day before the wedding. It was an exciting and cautious trip in the car trying to keep all the flowers on the cake and intact. I hired a cake stand to add extra height to the cake and whipped up a batch of royal icing to glue the cakes together and popped it in a icing bag so pipe it easily into place in situ. Each tier of the cake required a generous dose of royal icing to hold it in place but not too much so it oozes out the sides. When royal icing dries it’s rock solid. That cakes wasn’t going to be moving anywhere! With all 5 tiers stacked and arranged with the floral cascade running down the front and the joins in the ribbons running down the back I could then add more flowers to fill in the gap that I left to pick the cake up down the back. Amazingly only 2 flowers fell off in the process! Royal icing was a perfect glue and each flower didn’t need to be held in place for hours! The final result was everything that I had hoped for. 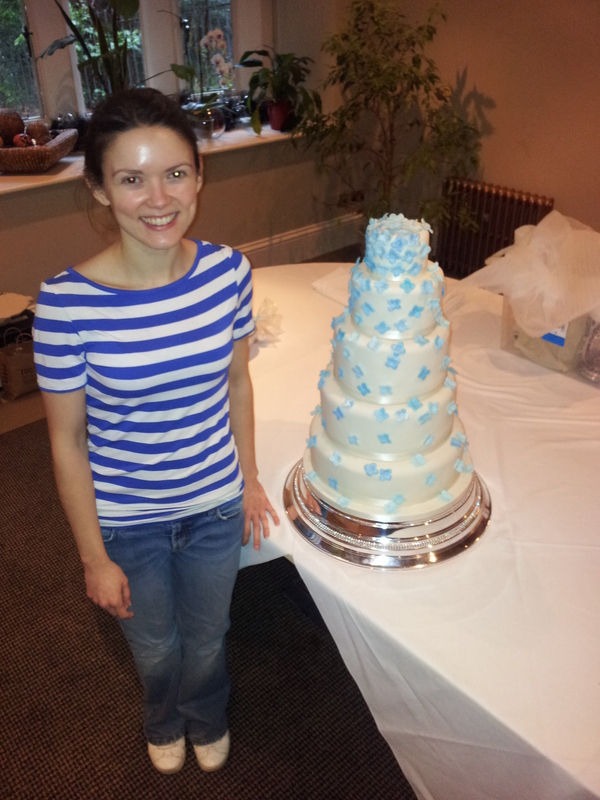 The 5 tiers of fruit cake ontop of the cake stand made it almost as tall as me! Please excuse the lack of make up and scraped back hair. I have no idea how the wonderful staff at Jesmond Dene House managed to manoeuvre the gargantuian cake upstairs. The 12 inch tier by itself was just about all I could carry! When we arrived at JDH after the ceremony it was amazing to see everything all together. I loved it. The flowers, the cake, the vintage glass, the real fire, and the sweets and treats I’d made. It was a dream come true with all of my most favourite people in the world together in one room! It was the most perfect day. And then we got to cut the cake and the dancing began. I didn’t sit down all night but I managed to squeeze in a sneaky slice of wedding cake and it was truly my best ever cake. Rich, extremely fruity and moist, with not too much of an alcoholic burn. The 3 months of maturing were a really good idea! I love the amaretto and cherries. I will definitely be using this recipe again in the future. What an adventure. This is without doubt my most epic bake yet. Exciting and exhausting in equal measures. I daresn’t even think how much time and energy I spent on the whole cake process, in fact I’m not even going to consider it (or how much I spent on eveything along the way) as it would detract from the very happy memories. I’m so proud that I could make my own wedding cake. 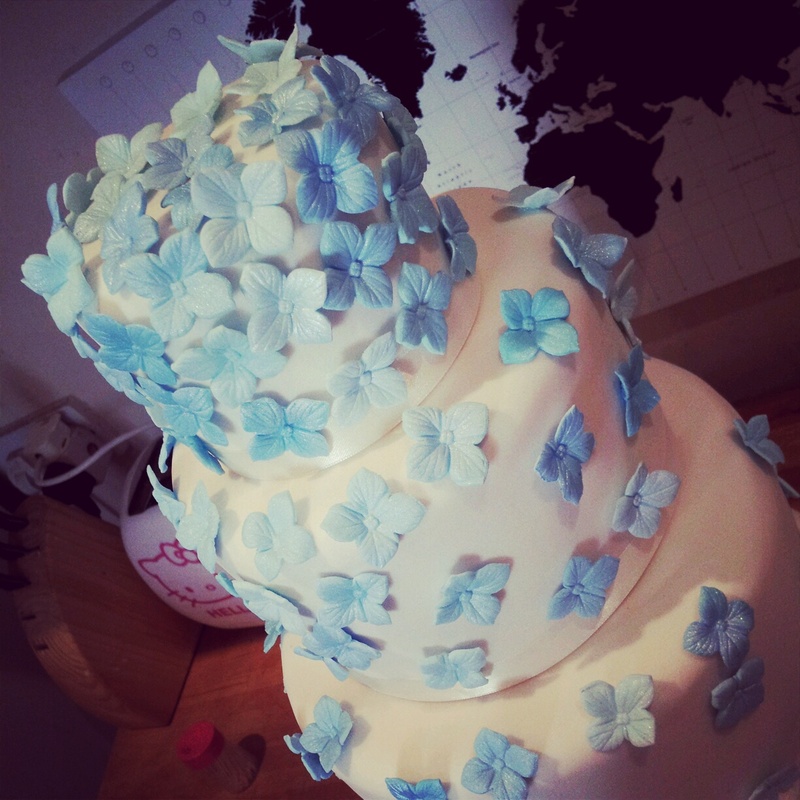 Who would have thought a year ago when I hadn’t even made pastry before that I’d be baking and icing a 5 tier wedding cake? I’m very grateful for the help I’ve had along the way too. It was all the more special that I made it myself and that I could share with all of our family and friends. I even posted some to my Aunty Carol in Canada. Cutting the wedding cake is supposed to bring good luck to the marriage. I wonder if making it yourself gives you extra kudos in the luck stakes? What a gorgeous bouquet! 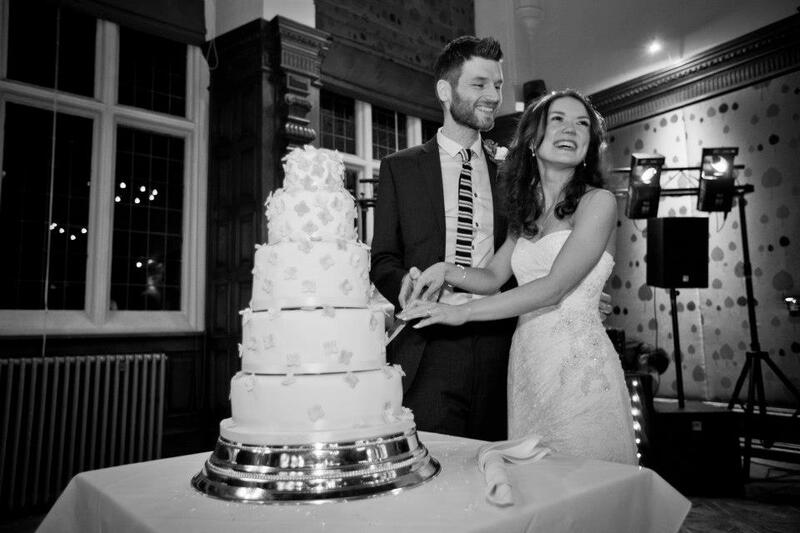 (First wedding photo) and what a huge accomplishment to bake your own five-tier wedding cake, plus frost it, decorate it and transport it. Congratulations, Lauren! Thank you so much Sharyn! It was quite an epic bake but I thoroughly enjoyed it. It’s all the more satisfying to know that I did it myself. How did you cut/slice the cake for the guests? I want to make a similar fruit cake, possibly 3 tiers for about 70 people so I would like to know how to cut the cake. Hello your cake sounds lovely. The hotel cut our cake up for us by slicing all the way across horizontally and then cutting it into When I cut it myself I cut a bit chunk off like that (as much as I think I will need) and then portion it out. Each serving is about a 2 inch rectangle (length of the iced part of the slice) and about 1cm thick. I always double wrap the remaining cake once sliced with greaseproof and then foil to stop ot drying out. Hope that helps! Enjoy your cake! Can I ask a small question please? I’m making my cousin’s cake and similarly to you I have to drop the cake off and assemble it the night before at the venue. How did you protect/cover your cake until the next day? I’m worried about leaving it overnight in the venue uncovered in case it gets dusty or nibbled! Hello Hopscotchlolly Thanks so much for reading! I assembled my cake at the venue the day before and asked the venue to look after it for me. They kept it in a locked room with all of the other things we dropped off for the tables. I didn’t use a protector but if you’re worried perhaps you could loosely cover it with a cloth or polythene? Perhaps your venue can advise as they must store other cakes? If it’s fondant icing it should be quite resilient and as long as the room is clean it’s not going to get dusty but I would worry about making the icing sweat or knocking fondant decoration off by covering it. I hope that helps and I’d love to hear how you get on. All the best! Came across your pics on google whilst searching for JDH as a potential wedding venue! Your day looked amazing – really making me want to chose there! I was just wondering what you thought about the size? It is the only thing that I’m slightly worried about! As I want a Winter wedding also, and considering the North East weather – I am concerned 100 people will be cramped inside during the change over from ceremony to breakfast. How did you find this? Hi Kathryn congratulations! I loved Jesmond Dent House. It’s so pretty and the food and staff were amazing. We had 100 daytime guests and 120 nightime. If I remember correctly the bar area was a bit of a tight squeeze but we all spread out into the hallway for drinks and canapés and it didn’t seem to be a problem. Also some people used that time to check in to the hotel and freshen up too. Hope that helps and enjoy planning your special day!! ← Where to start when icing a 5 Tier Wedding Cake?